For Sanat Kumara from Theosophy, see Sanat Kumara. The Kumaras are four sages (rishis) who roam the universe as children from the Puranic texts of Hinduism, generally named Sanaka, Sanatana, Sanandana, and Sanatkumara. They are described as the first mind-born creations and sons of the creator-god Brahma. Born from Brahma's mind, the four Kumaras undertook lifelong vows of celibacy (brahmacharya) against the wishes of their father. They are said to wander throughout the materialistic and spiritualistic universe without any desire but with purpose to teach. All four brothers studied Vedas from their childhood, and always travelled together. The Bhagavata Purana lists the Kumaras among the twelve Mahajanas (great devotees or bhaktas) who although being eternally liberated souls from birth, still became attracted to the devotional service of Vishnu from their already enlightened state. It also mentions them as being an avatar of Vishnu. They play a significant role in a number of Hindu spiritual traditions, especially those associated with the worship of Vishnu and his avatar Krishna, sometimes even in traditions related to the god Shiva. The group is known by various names: "Kumaras" (the boys/male children/young boys), "Chatursana" or "Chatuh sana" (the four with names starting with Sana) and "Sanakadi" (Sanaka and the others). Individual names usually include Sanaka (Ancient), Sanatana (Eternal), Sanandana (Ever Joyful) and Sanatkumara (Ever Young). Sometimes, Sanatana is replaced by Sanatsujata. A fifth Kumara named Ribhu is sometimes added. Sometimes, the Kumaras are enumerated as six with Sana and Ribhu or Sanatsujata added. Though in Mahabharata, total seven sons are mentioned, namely: Aniruddha, Sana, Sanatsujata, Sanaka, Sanandana, Sanatkumara, Kapila, and Sanatana and further mentions that,"Knowledge comes to these seven rishis, of itself (without being dependent on study or exertion). These seven are wedded to the religion of Nivritti (inward contemplation). Sanatkumara in Sanskrit means "eternal youth". He is the author of the Sanatkumara Samhita, which is part of the Shiva Purana, and has 59 chapters. It is also taken as a part of the Pañcaratra, Vaishnavite devotional texts. Also mentioned is the Tirtha of Kanakhala near Gangadwara or Haridwar, where through extensive tapas, he attained great ascetic powers. 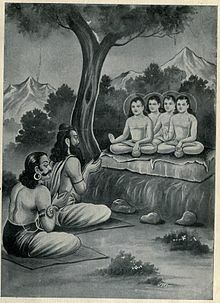 The four Kumaras learnt the Vedas at the age of four or five. They thus became great jnanis (learned beings), yogis and Siddhas (the perfect enlightened ones). The Kumaras remained in form of children due to their spiritual virtues. The age of the sages varies in various sacred texts. While five is the most popular, they are also mentioned as being Five-year-old youths. They practised the vow of renunciation (Sannyasa) and celibacy (brahmacharya) and remained naked. They wander together throughout the materialistic and spiritualistic universe without any desire but with purpose to teach. They are sometimes included in the list of Siddhars (Tamil equivalent for Siddha). The four Kumaras are said to reside in Jana Loka or Janar loka (loka or world of the intellectuals in the present parlance) or in Vishnu's abode Vaikuntha. They constantly recite the mantra Hari sharanam (Vishnu – "God the Redeemer our Refuge") or sing Vishnu's praises. These hymns and glories of Vishnu serve as their only food. Another son of Brahma, the sage Narada, who is described as their disciple, extolls their virtues in the Padma Purana. Narada says though they appear as five-year-old children, they are the great ancestors of the world. They are possessed also of deep knowledge of the Sankhya philosophy. They are preceptors of the scriptures on duty and it is they that introduce the duties of the religion of Nivritti (inward contemplation), and cause them to flow in the worlds". The discourses of the four Kumaras are found in the Hindu epic Mahabharata as well as the Bhagavata Purana. The Shanti Parva book of the Mahabharata describes the discourse given by the four Kumaras to the demon king Vritra and his guru – the sage Shukra. The king and his guru worship the Kumaras and then Shukra asks them to describe the greatness of Vishnu. 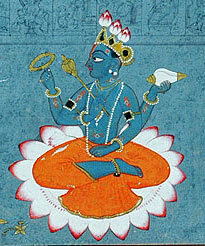 Sanat-kumara starts with describing Vishnu as the creator and destroyer of all beings. He equates Vishnu's body parts with parts of the universe and the elements, for example the earth is Vishnu's feet and water is his tongue. All gods are describes as being Vishnu. Then Sanatkumara categorizes all beings into six colours depending upon the proportion of the three gunas: Sattva (pure), Rajas (dim) and Tamas (dark). From the lowest to the foremost beings, the colours are dark (Tamas is high, Rajas is mid, Sattva is low), tawny (Tamas is high, Sattva is mid, Rajas is low), blue (Rajas is high, Tamas is mid, Sattva is low), red (Rajas is high, Sattva is mid, Tamas is low), yellow (Sattva is high, Tamas is mid, Rajas is low) and white (Sattva is high, Rajas is mid, Tamas is low). (The Vishnu Purana gives non-living things, lower animals and birds, humans, Prajapatis, gods and the Kumaras are respective examples of the above colours.) Sanat-kumara elaborates further how a Jiva (living entity) journeys from dark to white in his various births, ultimately gaining moksha if he does good deeds, devotion and yoga. The Bhagavata Purana narrates the visit of the four Kumaras to the court of King Prithu, the first sovereign in Hindu mythology and an avatar of Vishnu. The king worships the sages and asked them about the way of emancipation (moksha) that can be followed by all people who caught in the web of worldly things. Sanat-kumara tells the king that Vishnu is the refuge to all and grants liberation of the cycle of births and rebirths. His worship frees one from material desires and lust. One should be freed from material objects, lives a simple life of non-violence and devotion of Vishnu and follows the teachings of a good guru and undergo Self-realization. One should realize that all living things are forms of God. Without devotion and knowledge, humans are incomplete. Out of four purusharthas ("goals of life"), only moksha is eternal, while religious duty, wealth and pleasure decay with this life. While all beings are subject to destruction, the soul and God in our bodies is eternal. So it is paramount that one surrenders to God (as Vishnu or Krishna), said Sanat-kumara ending his counsel. Prithu worships the Kumaras again, who blessed him. The first section or Purvabhaga of Naradiya Purana, an upapurana has 4 padas or sections, each told by the four Kumaras respectively to Narada. Brahma, who had received the knowledge of the Puranas from Vishnu, imbibed this to his Four Kumaras, who then taught the Puranas to Narada. Narada transmitted it to Vyasa, who scripted them into the Puranic texts. The Vishnu Purana is recorded in two parts, the Vishnu Purana and Naradiya Purana. The teachings of Sanaka of the Kumara brothers are contained in the Naradiya Purana which is also divivided in two parts, the first part containing the teachings of Sanaka and others. Jaya, the dvarapala, in image from Chennakesava Temple. The four Kumaras roamed around at their free will with their cosmic powers all over the universe. During one of their sojourns, they arrived at Vaikuntha, the abode of Vishnu. The city, with the residence of Vishnu located at the center of seven circular walls, is considered as a place of bliss and purity. It has seven gates of entry. The four Kumaras passed through the first six gates without any hindrance. The seventh gate was guarded by Jaya and Vijaya, the two dvarapalas (door-guards) of Vishnu's palace. The angry guardians stopped the four Kumaras and laughed at them since they looked like children and were also naked, and did not permit them to enter through the seventh gate. The four Kumaras were perplexed by the behaviour of the gatekeepers as they had not faced such a situation and ridicule anywhere else. They expected Jaya and Vijaya to be like their master Vishnu, who does not differentiate among beings. Enraged, the Kumaras cursed them to be born on earth thrice, as three villains with characteristics of "lust, anger and greed". The gatekeepers accept the curse and bow to the Kumaras and beg for their forgiveness. Lord Vishnu who learnt of the incident, appeared before the Kumaras in all his glory with his retinue. The four Kumaras, who were on their first visit to Vaikuntha, took in by the sight and the glittering divine figure of Vishnu. With deep devotion, they appealed to him to accept them as his devotees and allow them to offer worship at his feet for all time to come and let his feet be their final emancipation. Vishnu complied with their request and also assured Jaya and Vijaya that they will born as demons on earth but will be released from all births (killed) by an avatar of Vishnu. The two guards were dismissed by Vishnu to go and suffer the curse of the Kumaras on earth and then only return to his abode, after the end of the curse. The two banished guards were then born on earth, at an inauspicious hour, to the sage Kashyapa and his wife Diti as asuras who were named Hiranyakashipu and Hiranyaksha. Subsequently, in Satya Yuga, they were born as Hiranyakashipu and Hiranyaksha, to Diti (daughter of Daksha) and Kasyapa. Lord Vishnu undertook the Varaha Avatar to kill Hiranyaksha, and the Narasimha avatar to kill Hiranyakasipu. In the second life, during the Treta Yuga, they were born as Ravana and Kumbhakarna and defeated by Rama avatar as mentioned in the epic Ramayana. Finally, in their third and final life in Dwapara Yuga, they were born as Sishupala and Dantavakra during the time of Krishna avatar, also mentioned in epic Mahabharatha. Shiva had assumed the form of Dakshinamurti, the great teacher and meditating facing South observing a vow of silence. The four Kumaras approached Shiva for self-realization. He taught them about the Supreme reality – Brahman by making chin mudra gesture with his hand. The index finger is touched to the thumb, indicating the union of Brahman and jiva. Thus, Shiva made the Kumaras as his disciples. The Linga Purana describes that Shiva or his aspect Vamadeva will be born as a Kumara and then multiply into the four Kumaras in each kalpa (aeon) as sons of Brahma of that kalpa. In the 29th Kalpa, Swetha Lohita is the main Kumara; where they are named as Sananda, Nandana, Vishwananda and Upananadana of white colour; then in the 30th Kalpa, they are named as Virajas, Vivahu, Visoka and Vishwbhavana, all of red colour; and in the 31st Kalpa in yellow colour; and in the 32nd Kalpa, as of black colour. The four sages Sanak,Sanandan,Sanatan,Sanat were learned Brahmins. They were the sons of Lord Brahma. They were very proud of their father, Brahma because he was the creator of the holy books, Vedas. They were aware of three Vedas,- Rigved, Yajurved, and Samveda and considered that the whole knowledge is complete in these three books.On the other hand, Sage Atharva approached Lord Shiva to get approval of his knowledge which he gathered from the universe using his divine powers. Lord Shiva, impressed by his creation and blessed Sage Atharva that his book of knowledge would constitute the list of Vedas and will be called as ‘Atharvaveda’. When this news reached the sons of Lord Brahma, they protested as according to them the other three Vedas was a complete set of knowledge and there was no need of fourth Veda. They argued with Lord Shiva and challenged his authority to certify a fourth Veda. Finally, in all humble fairness and peaceful reverence for not blemishing the value of the wealth of knowledge, the decision whether to certify a fourth Veda or not, was mutually agreed to be purely depend upon the results of a Knowledge-debate (Jyan-Vivad) amongst them (i.e. 4 Kumaras' & Lord Shiva). Goddess Saraswati was appointed as judge. The four Sages addressed very complicated questions to Lord Shiva and were very confident of their victory. But Shiva, who is the Lord of all the Supreme Knowledge, answered each and every question. The Sages accepted their defeat gracefully and asked for forgiveness. Since then Artharva Veda was added to the list of Vedas, making the total four. The Sages went to their brother Prajapati Daksha who was bitter rival of Lord Shiva. On listening about the defeat of his four brothers, he cursed them to be small children. After that the four sages turned into small children. Since the sages were very learned, they thanked their brother for the curse because after becoming children their urge for learning would be greater. An incident about the meeting of the four Kumaras with Vishnu's avatar Rama is narrated in the Uttarakanda of the Ramcharitmanas. The Kumaras once stayed in the hermitage of the sage Agastya, who told them about the glory of Rama. So to meet Rama, they went to a forest grove where Rama with his brothers and disciple Hanuman had come. Rama and his brothers were so pleased with meeting the four enlightened sages that they paid obeisance to them. The sages were wonder struck looking at the divinity of Rama that they prostrated before him and out of great ecstasy started shedding tears of happiness. Rama looking at the sages was deeply impressed and asked them to be seated and praised them for their great achievements and their erudite knowledge of the Vedas and Puranas. The four Kumaras were also delighted to hear the words of praise showered on them by Rama. They in turn extolled his great virtues in a hymn. Vaishnavism (the sect that worships Vishnu as the Supreme) is divided into four sampradayas or traditions. Each of them traces its lineage to a heavenly being. The Nimbarka Sampradaya, also known as the Kumara Sampradaya, Catuḥ Sana Sampradaya and Sanakadi Sampradaya, and its philosophy Dvaitadvaita ("duality in unity") is believed to be propagated in humanity by the four Kumaras. The swan avatar of Vishnu Hamsa was the origin of this philosophy and taught it to the four Kumaras, who in turn taught Narada, who finally passed it to the earthy Nimbarka, the main exponent of the sampradaya. ^ a b c d e "Bhaktivedanta VedaBase: Srimad Bhagavatam 3.12". Vedabase.net. Archived from the original on 2 March 2013. Retrieved 22 December 2012. ^ a b c D Dennis Hudson (25 September 2008). The Body of God:An Emperor's Palace for Krishna in Eighth-Century Kanchipuram: An Emperor's Palace for Krishna in Eighth-Century Kanchipuram. Oxford University Press. pp. 355–. ISBN 978-0-19-536922-9. Retrieved 22 December 2012. ^ James G. Lochtefeld (2002). The Illustrated Encyclopedia of Hinduism: Volume Two. The Rosen Publishing Group. pp. 592–. ISBN 978-0-8239-3180-4. Retrieved 17 December 2012. ^ "Bhaktivedanta VedaBase: Srimad Bhagavatam 6.3.20–21". Vedabase.net. Archived from the original on 4 February 2012. Retrieved 22 December 2012. ^ Alain Daniélou (1 December 1991). The Myths and Gods of India: The Classic Work on Hindu Polytheism from the Princeton Bollingen Series. Inner Traditions / Bear & Co. p. 165. ISBN 978-0-89281-354-4. Retrieved 26 December 2012. ^ a b c d Mani, Vettam (1975). Puranic Encyclopaedia: a Comprehensive Dictionary with Special Reference to the Epic and Puranic Literature. Motilal Banarsidass Publishers. p. 682. ISBN 978-0-8426-0822-0. ^ Bhag-P 3.15.12 Bhagvata Purana "Lord Brahma said: My four sons Sanaka, Sanatana, Sanandana and Sanatkumara, who were born from my mind"
^ a b The Vishńu Puráńa: A System of Hindu Mythology and Tradition. Oriental Translation Fund of Great Britain and Ireland. 1840. pp. 38–9. Retrieved 22 December 2012. ^ "The Vedic dharma (religion) is verily twofold, characterised by Pravritti (social action) and Nivritti (inward contemplation), designed to promote order in the world; this twofold dharma has in view the true social welfare and spiritual emancipation of all beings. "-Adi Shankaracharaya (A.D. 788–820). ^ Part Seven Chapter I — Dialogue between Narada and Sanatkumara by Swami Nikhilananda. ^ Chapter Three: Sanatkumara's Instructions on Bhuma-Vidya by Swami Krishnananda, The Divine Life Society, Shivananda Ashram, Rishikesh, India. ^ Sanatkumara The Mahabharata translated by Kisari Mohan Ganguli (1883 -1896), Book 12: Santi Parva: Mokshadharma Parva: Section:CCLXXX. p. 295. "While they were thus conversing with each other there came unto them the great sage Sanatkumara of righteous soul for the purpose of dispelling their doubts. Worshipped by the prince of Asuras and by the sage Usanas, that foremost of sages sat down on a costly seat.". ^ Narada The Mahabharata translated by Kisari Mohan Ganguli (1883 -1896), Book 2: Sabha Parva: Lokapala Sabhakhayana Parva, section:XI. p. 25 And Daksha, Prachetas, Pulaha, Marichi, the master Kasyapa, Bhrigu, Atri, and Vasistha and Gautama, and also Angiras, and Pulastya, Kraut, Prahlada, and Kardama, these Prajapatis, and Angirasa of the Atharvan Veda, the Valikhilyas, the Marichipas; Intelligence, Space, Knowledge, Air, Heat, Water, Earth, Sound, Touch, Form, Taste, Scent; Nature, and the Modes (of Nature), and the elemental and prime causes of the world,--all stay in that mansion beside the lord Brahma. And Agastya of great energy, and Markandeya, of great ascetic power, and Jamadagni and Bharadwaja, and Samvarta, and Chyavana, and exalted Durvasa, and the virtuous Rishyasringa, the illustrious Sanatkumara of great ascetic merit and the preceptor in all matters affecting Yoga..."
^ Kanakhala The Mahabharata translated by Kisari Mohan Ganguli (1883 -1896), Book 3: Vana Parva: Tirtha-yatra Parva: Section CXXXV. "Here, O king, before thee is the Kanakhala range, the favourite resort of sages. 'And yonder is the mighty river Ganga. Here, in ancient times, the holy sage Sanatkumara attained ascetic success. O scion of the Ajamidha race, by performing thy ablutions here in this river, thou wilt be freed from all thy sins." ^ a b c d e f g h i Chandan Lal Dhody (1 January 1995). The Adhyātma Rāmāyaṇa: Concise English Version. M.D. Publications Pvt. Ltd. p. 274. ISBN 978-81-85880-77-8. Retrieved 25 December 2012. ^ Vaisampayana continued... The Mahabharata translated by Kisari Mohan Ganguli (1883 -1896), Book 12: Santi Parva, Part 3, Section: CCCXLI. p. 147 "The puissant Lord who is charged with the creation of all the worlds is called Aniruddha, Sana, Sanatsujata, Sanaka, Sanandana, Sanatkumara, Kapila, and Sanatana numbering the seventh,--these seven Rishis are known as the spiritual sons of Brahman. Their knowledge comes to them of itself (without being dependent on study or exertion). These seven are wedded to the religion of Nivritti. They are the foremost of all persons conversant with Yoga. They are possessed also of deep knowledge of the Sankhya philosophy. They are preceptors of the scriptures on duty and it is they that introduce the duties of the religion of Nivritti, and cause them to flow in the worlds. ^ Mahabharata Published by Geeta Press in Gorakhpur. Written in Hindi. ^ Deshpande 2005, pp. 66–69. ^ Swami Venkatesananda; Venkatesananda (Swami.) (1989). The Concise Śrīmad Bhāgavataṁ. SUNY Press. p. 53. ISBN 978-0-7914-0149-1. Retrieved 25 December 2012. ^ V. Ravi (2010). Lalita Sahasranama. MANBLUNDER. pp. 432–3. GGKEY:BH0QHZDKYK6. Retrieved 26 December 2012. ^ Tulasīdāsa; R. C. Prasad (1 January 1999). Tulasīdāsa's Śrī Rāmacaritamānasa: The Holy Lake of the Acts of Rāma. Motilal Banarsidass. pp. 713–. ISBN 978-81-208-0762-4. Retrieved 17 December 2012. Dalal, Roshen. Hinduism an Alphabetical Guide. Penguin. ISBN 978-0143414216. Deshpande, Aruna (2005). India: A Divine Destination. Crest Publishing House. pp. 66–69. ISBN 81-242-0556-6.